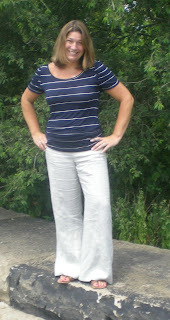 Here is what I wore yesterday. I have found in my search to define my style that I like clothing with interesting details. Like this shirt for instance, it has a crochet type detail on the back and is rouched on the sides (and the nautical stripes)! Wow! Another bonus is this also helps to add interest to my outfits since I am not much of a jewelry wearer. I have everyday jewelry items that I wear, but that's about it. What things do you look for in your clothing to add interest? 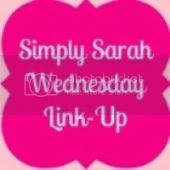 I'm linking up with Simply Sarah and The Pleated Poppy today. I love that striped top! I don't like wearing jewelry either if my top has any detailing on it like that. I usually wear necklaces with just a plain top. I love the crochet detail on that top - it definitely takes it up a notch from the everyday striped top! These Booties are Made for Walking! The pool and other weekend fun! Red, White, and Blue without a Clue!